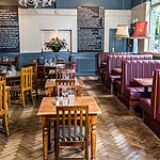 The Oxford is nice and relaxed pub which offers delicious British pub food with a Modern European twist. Do you work at The Oxford? What did you think of The Oxford? We had our wedding reception at The Oxford because we used to be their local and knew their food was amazing. All of our guests were satisfied with a wide range of menu and the quality of food. Their home made fishcake was awesome. Their service was professional and staff were friendly. The manager and team worked hard and made our party unforgettable. They organised venue decoration for us and cared for our guests throughout the party. We definitely recommend The Oxford! Cracking little boozer with charming well informed service. Lot's of little quirks dotted around the place. This is no uniform pub. Management couple are really friendly & their passion eminates throughout the pub. I only wish they had a beer garden. food excellent quality busy on saturdays and perhaps a little too loud to dine when the dining area is full and the pub section is busy but earlier in the week its perfect. Nice decor nice atmos great grub easy transport links. The Oxford is quite cool downstairs and nice to sit outside at on a hot day. It has a big function room upstairs as well which is good for a party. More a pub for drinking with mates, not really for starting a big night out at. 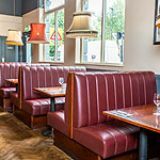 With a mouthwatering menu, stately design and cosy atmosphere, the Oxford takes pride of place on the busy Kentish Town Road. The Oxford can be found halfway down Kentish Town Road, a stone's throw from Underground and train links, and the heavily-frequented HMV Forum concert hall. Spread over two floors and several different sections, the bar stands out with an all-black exterior, complemented by several weighty wooden tables making up an outside dining area. Moving indoors, you enter the “pub” section, with trestle tables and a large, well-stocked bar on the left hand side. Huge gilt-framed mirrors and ornate flower arrangements are offset disarmingly by racks of flyers for local gigs, and the setting is grand without being restrictively formal. The secluded dining area, towards the back of the room and past the tiled, open-front kitchen which follows on from the bar, is altogether more spacious, with a great deal of wooden tables and diner-style booths laid out under a chandelier centrepiece, and a genuine fireplace off to one side. Wall-sized blackboards hold the day’s specials, whilst mirrors, candles and black & white prints of the surrounding area lend an unhurried sophistication to proceedings. Meanwhile, a function room containing plush leather chairs, carpets and a small bar of its own is available for hire upstairs, its French windows letting in a great deal of natural light during the day and making the space seem larger than life. A great deal friendlier than your average Kentish Town watering hole, the staff at the Oxford have seemingly mastered the art of dealing with large crowds courteously and efficiently. Extremely busy towards the end of the week – especially when frequented by Forum-goers, who can present their ticket to receive 15% discount on food – the atmosphere in the bar is nonetheless bustling and cordial, and the dining area is positively cosy, the booths providing real intimacy among the hubbub. 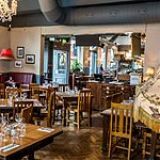 All in all, a great spot for a pre-or-post-gig drink, or indeed a quiet meal out – impressive versatility for a bar that also features weekly jazz concerts of its own, and a popular pub quiz every Tuesday in the upstairs function room. Not for nothing is the Oxford's ground floor kitchen proudly exposed for all to see – the gastro menu, adapted for lunch and dinner, is one of the main draws of an already appealing establishment, and you’ll find filling and tasty morsels such as pan-fried salmon fillet with kale and poached egg (£13.50), and a sensational beef and ale pie (£11). The starters (£6-£7) are well thought out and delicious (the chicken liver and cognac parfait with toast is particularly recommended), and the dessert menu (£5.25), while brief, is consistently satisfying as well – a three-course meal can very easily stun you into a hazy state of agreeable inertia, without ruining you into the bargain. 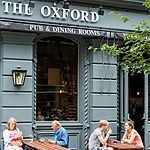 The Oxford bar acquits itself admirably as well – there are no major surprises, just some unexpected brands like Vedett bottled beer and Patron tequila among the standard array of liqueurs and real ales. The wine list is pleasingly varied, with bottles priced at around £12, and cocktails can be whipped up should you be in the mood – the bar staff are experienced and agreeable throughout, even on busy nights. 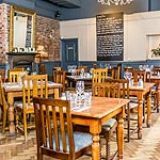 A warm, welcoming gastro pub in a busy, up-and-coming area, the Oxford trumps the nearby competition hands down, and comes thoroughly recommended should you be in the area.